Nose: Vanilla, canned fruit salad, sweet spices – cloves and a bit of cinnamon, sultanas, and fresh wood. Quite spicy and vapoury on the nose. Palate: Dried fruits, oak spices, fresh vanilla pods, malt, and notes of old wood. Quite mellow – too mellow really. Tiny traces of something really sweet and dark such as golden syrup. Mouthfeel: Really light, almost watery thin. Extremely smooth, and absolutely no burn. Finish: Not a particularly long finish. Lots of wood notes, with traces of vanilla. A little bit spicy, but just a little bit. I can’t say I’m a big fan of this whisky – the flavours are alright, although not my favourite; the whisky however is just really lacking – the weight on the tongue is very thin and light, the finish is short, and the palate is quite watery. It was bottled at 40%, and in my opinion should probably have been bottled at cask strength. 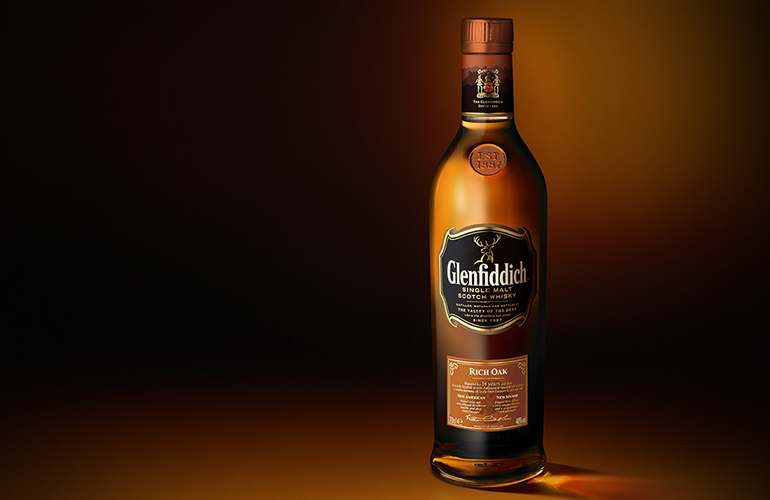 The Glenfiddich Rich Oak was aged for 14 years in ex-Bourbon barrels before a quick finish of 18 weeks – 12 weeks in virgin Spanish oak casks followed by 6 weeks in virgin American oak casks before being bottled. Reportedly the Glenfiddich coopers had an unusually large amount of influence over the maturation and casking of the Rich Oak, and this whisky is the first single malt Scotch to have been finished in both American and Spanish virgin oak casks. How do I introduce a distillery such as Glenfiddich? The world’s best selling single malt Scotch, owned by the largest family-owned Scotch distillery group – William Grant & Sons (currently run by fifth-generation family member Peter Gordon). The Glenfiddich distillery, based near Dufftown in the Scottish Speyside, was opened in 1903, after construction was started in 1886. The Glenfiddich draws its water from the Robbie Dhu springs. Glenfiddich’s stills are smaller than most current distilleries, although they do have 28 of them, which produce 10 million litres of spirit per year, and still keeps a permanent team of craftsmen around to maintain them. Glenfiddich warehouses all their whisky in their 43 warehouses, which hold 800,000 barrels of whisky – that’s right, I said 43 warehouses! William Grant also own the nearby Balvenie and Kininvie malt distilleries, among others. William Grant & Sons own a number of other brands along with Glenfiddich, Grant’s, Balvenie, and Kininvie; they also own Hendrick’s Gin, Tullamore Dew, Sailor Jerry Rum, Monkey Shoulder blended whisky, Clan MacGregor, Gibsons Canadian Whisky, Drambuie, and more. Normally I’m of the opinion that any whisky is worth trying at least once, but in this case I’d recommend leaving it in the bottle unless you’re desperate for a drink. Glenfiddich have much better options available.